On 20 June 1837, Princess Alexandrina Victoria became Queen, and promptly dropped the “Alexandrina”—neither the first nor the last example of her independent spirit. She had a mind of her own, and nobody, even Prince Albert, succeeded completely in crushing that powerful sense of self. I had always felt sorry that she hadn’t a longer time to enjoy her independence before marrying Prince Albert, who was actually the “Victorian” in the sense we understand Victorian morality. In spite of a childhood that reads like a Gothic novel or a Victorian melodrama, in spite of being ruled and jealously guarded by bullies, she had promised to be a possibly saner version of her pleasure-loving uncles (although her fashion tone-deafness would have horrified King George IV). 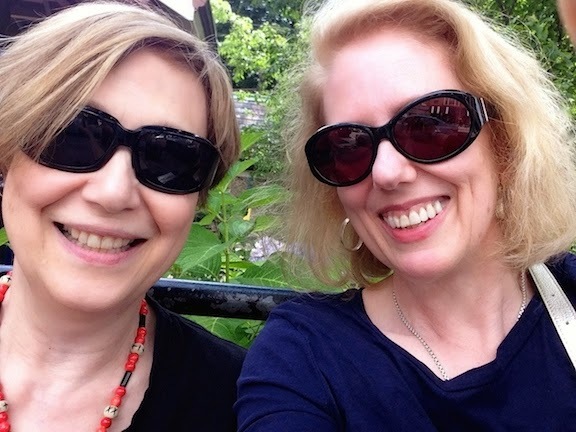 She was smart, well-educated, fun-loving, spirited, open-minded, and frank. We've all heard that Prince Albert turned her into a prude. But that isn’t the whole story. He never completely crushed the spirited girl, and he didn’t get his way in everything, as Gillian Gill points out in her brilliant biography, We Two: Victoria and Albert: Rulers, Partners, Rivals. It deals with their marriage, yes. But it also provides one of the most moving and insightful accounts I’ve ever read of the events preceding her birth, most notably the life and death of Princess Charlotte, King George IV’s only legitimate child. I’ve read lots of biographies, and they’re not always scintillating. And frankly, I had given up reading about her because, well, it's too depressing. But this book reads like a novel. I bought it some years ago, and find myself returning to it again and again. For one thing, it gave me the impetus to celebrate today the bright beginning of her story as monarch. On 20 June 1837, Albert was still in the future, and she was a survivor, enjoying a hard-won triumph over her ghastly childhood. She was experiencing the first precious moments of freedom, and embarking on the role for which she’d been preparing for eighteen years. 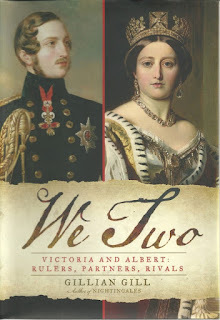 We Two is a 2NHG Library recommendation. No disclaimer is required because I bought it with my very own money. May I add a recommendation in Victoriana? I am currently reading Kate Hubbard's SERVING VICTORIA: LIFE IN THE ROYAL HOUSEHOLD. The private thoughts, reactions and experiences of those around the queen are fascinating. Oooh! I'm well interested- have to look for it, and LOVE the non-disclaimer! I love this book! And yes, the whole section on Princess Charlotte was excellent; I hadn't realized that Albert was groomed for her as a replacement for Leopold, essentially, before I read it.